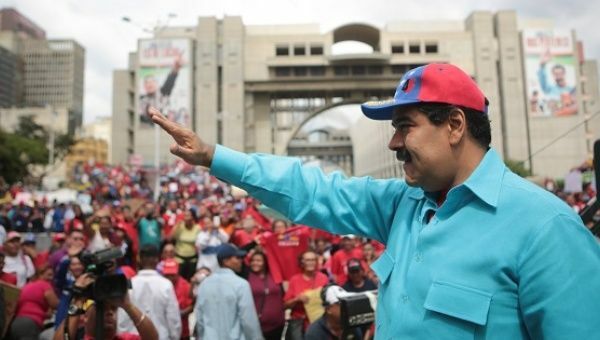 Some words you will rarely read in media coverage of Venezuela include “capital strike,” “economic sabotage,” “destabilization plan,” “coup d'état” or others which provide a far more complete and accurate account of what is going on in the country. For while the crisis is real, it is also the result of an ongoing attempt by the country's elite and international forces like the U.S. government to subvert the Maduro presidency. In so doing, the role of the media is to wage psychological warfare against the Venezuelan government, doing its best to erode public support and sympathy for the struggling government. Many of the articles lead with stories of babies dying amidst power shortages, antibiotics in short supply and deaths from easily treatable hemorrhages in Venezuela's public hospital system. The crisis of medicine and medical equipment shortages is real. But for the right-wing press, it is simply a story about a socialist government mismanaging the economy, not providing enough dollars for pharmacies or medical suppliers to import the needed goods or otherwise seriously screwing up that basic mechanism of modern societies, the international supply chain—a cautionary tale about what happens when you hand the keys to a country over to leftists. But some numbers help explain what is actually going on. In 1998, Venezuela imported $222 million of medicine. In 2013, according to official numbers, that figure supposedly soared to $3.2 billion. But, as the economist Manuel Sutherland points out, the physical quantity of medicines which actually came into Venezuela decreased from 2003-2013, by 75 percent. 2003 was when the government imposed currency controls in reaction to ruinous capital flight. Sutherland argues that the privately-owned pharmaceutical sector takes advantage of the country's preferential exchange rate for medical supplies. It obtains dollars cheaply, then sells them dear, whether on the parallel market or to transnational corporations, which then repatriate the capital. The sector inflates its costs by falsifying import bills in order to make up the difference. The Venezuelan pharmaceutical crisis, then, is not the making of the Venezuelan government; it is largely the making of the private sector, with the government often turning a blind eye, Sutherland suggests, due to fear of further supply shortages, more intense political pressure from those transnationals parent governments and concern for officials' reputations. Many in the press are speaking the language of “humanitarianism.” The word is not innocent. Officials have often used it to lull the U.S. population into acceptance of one or another form of U.S-backed violence or political chicanery abroad—for example, unfounded claims about an “imminent massacre” in 2011 Libya, or in Kosovo in 1999. Maduro's opponents have used this language to actually call for the Organization of American States to suspend Venezuela from membership, under the grounds that its performance proves it is unfit to govern its own people. If those speaking this language are prepared to be consistent, here is one possibility: They should call for an intervention against the Venezuelan pharmaceutical industry and call for the nationalization of the country's pharmaceutical supply system. In fact, the government's unwillingness to simply expropriate the private pharmaceutical sector or build up a state-owned alternative made it continuously vulnerable to private-sector sabotage. The crisis of the pharmaceutical sector is emblematic of the larger tensions and conflicts around Venezuela's political trajectory. For years, despite all the fear mongering around Venezuelan socialism Hugo Chávez and then Maduro avoided nationalizing private industry or commerce. Instead, they used massive oil revenues to provide for the country's poor. In part this was to avoid the explosive domestic class conflict—and perhaps direct U.S. intervention—which would have resulted if the country had struck with more force at its private sector. This followed close on the May 13 declaration of a state of emergency. Such measures are the only ones which could help the government avoid the constant economic sabotage which produces the “crises” which the U.S. media is then able to use to present the Venezuelan government as unfit to govern. In any case, Venezuela is an oil state and relies on oil for the majority of its foreign exchange. This is also one reason that claims of hyper-inflation are misleading. Amidst inflation, the currency loses value against the dollar. But the government gets dollars for the oil it sells on the international markets. The issue is not inflation, but the loss of buying power of workers' salaries. Since maintaining buying power means subsidizing goods, the problem is not (or at least not merely, and not centrally) the rate of inflation. It is also about the loss of state resources to support workers' salaries through subsidies. And that in turn is linked to the rate oil prices have fallen—rapidly from 2014 through 2016. Venezuela received $70 million in oil export revenues in February 2016 as against $3 billion in January 2014. And where are the origins of that descent? Consider the comments of Saudi Prince Alwaleed Bin Talal Al Saud. The country, he said, is not happy with low oil prices, “but it's something you have to face head on, without hesitation.” OPEC decided not to decrease production quotas at its December 15 meeting, ensuring that prices remain low. Low prices means continued economic disarray for the oil-revenue-dependent countries of Russia, Iran and Venezuela—none of whom are exactly on the best of terms with the U.S. government, the major trading partner, backer, armorer, and funder of Saudi Arabia. As Iranian Oil Minister Bijan Namdar Zanganeh recently put it, what the other Persian Gulf countries “want to achieve is not at all for economic gains.” What he means is that Saudi Arabia, probably at the United States' behest, is using low oil prices as a weapon against countries which the U.S. does not like. But the dispatches from correspondents covering Venezuela do not include any account of the reasons for the continued decline in oil prices over the last two years. Be that as it may, the U.S. media's sudden focus on the Maduro government's supposedly self-inflicted crises has ultimately little to do with a concern for Venezuela's citizens, who after all have seen extreme poverty decrease markedly under the Chávez-Maduro governments, and a lot to do with advancing the U.S. regional agenda of what the economist Mark Weisbrot calls “rollback” of the continent's leftist and populist governments. The Guardian, in a revealing speculation, wonders if the Venezuelan government will be “the next leftwing domino to fall” after Brazil. Given that calls for intervention, expulsion of states from the OAS and economic sabotage all depend, to varying degrees, on either the passive consent or active support of the U.S. population for these policies, media misrepresentations of what is happening in Venezuela are a crucial tool of statecraft. They can destroy sympathy for Venezuela, head off solidarity campaigns and create and manipulate public opinion into support for state policies. For that reason, if Venezuela falls, the Western media will have played a key part in helping push the country over the edge.